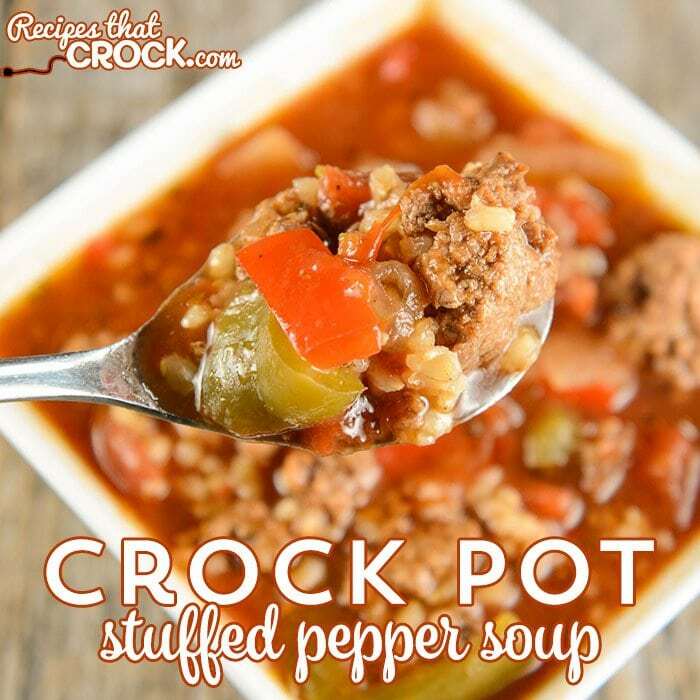 Slow Cooker Stuffed Pepper Soup - Recipes That Crock! We love this soup. And, by we I mean everyone but especially Miss Add. She loved it so much that she asked me to pack it in her lunch all week! NOW UPDATED with Cooking Show Video! 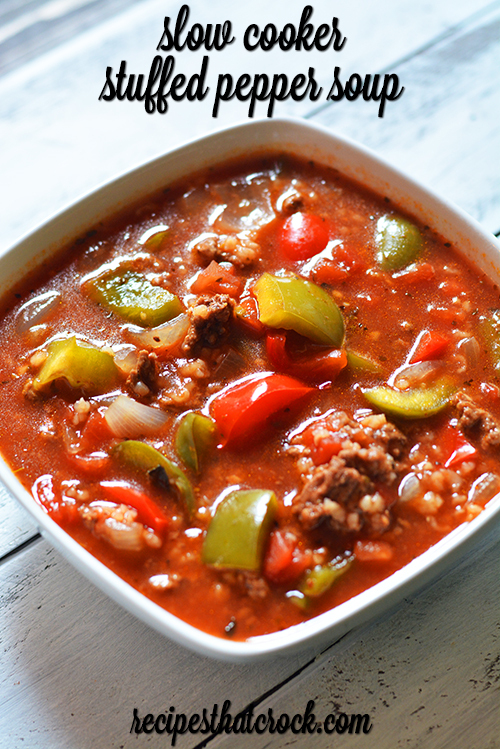 NEW Easy LOW CARB Slow Cooker Stuffed Pepper Soup Version Too! Watch the video below for an update on this recipe that simplifies it and reduces the carb count without losing the flavor- yum! So I threw all the leftovers in my favorite individual soup containers and sent them right along with her much to her delight! 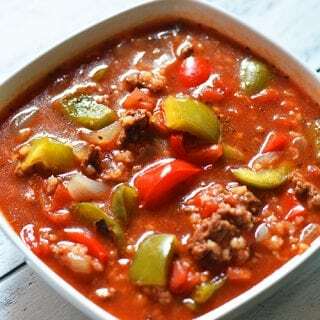 The base of this soup starts with browned ground beef and onion and layers in the flavors of the peppers, tomatoes and broth to make a fantastic soup that will have everyone coming back for more! We toss the rice in at the beginning of cooking, however some reader prefer to wait until the end. 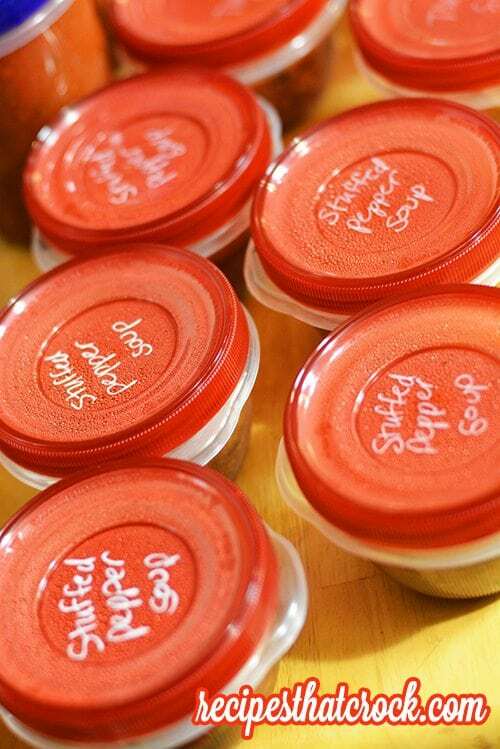 Oftentimes we freeze leftovers in my favorite individual soup containers. I’m often asked which slow cooker I would use for a specific recipe. Since there is a browning step involved in this recipe, I love to use my one of my favorite stove-top safe slow cookers that let you take the crock straight from cooking on the stove and throw into you slow cooker and continue cooking. One dish to clean up (vs. the crock AND a skillet) and anyone who knows me, knows I am ALL for that! Also– love the non-stick surface of this slow cooker. But now that I also have an automatic stirring slow cooker that I love for soups like this! We used one of our favorite varieties of diced tomatoes in this soup to give it some added flavor. Both the Basil, Oregano and Garlic and Roasted Garlic with Onions varieties would be fantastic in this soup. Note: If the video isn’t loading properly, you can watch it by clicking the button below. Slow Cooker Stuffed Green Pepper Soup is super simple to throw together and a reader favorite! Brown your beef with your onion in a skillet over medium heat. Add your Red Gold tomatoes (juice and all) and the rest of your ingredients. Slow Cooker Stuffed Green Pepper Soup from Gooseberry Patch's Slow Cooker Christmas Favorites. I'm often asked which slow cooker I would use for a specific recipe. Since there is a browning step involved in this recipe, I love to use my one of my favorite stove-top safe slow cookers that let you take the crock straight from cooking on the stove and throw into you slow cooker and continue cooking. One dish to clean up (vs. the crock AND a skillet) and anyone who knows me, knows I am ALL for that! Also– love the non-stick surface of this slow cooker. But now that I also have an automatic stirring slow cooker that I love for soups like this! I love your husband’s video! I found this recipe to be a little bland. I added a Tbsp of Worcestershire sauce and 1/4 tsp garlic. I added uncooked rice late in the process, but didn’t add extra liquid. The “soup” turned out more like a stew, but that’s what I was hoping for. Keep the recipes coming! can the stuffed pepper soup be frozen and then cooked in the slow cooker? Loved it! Will definitely make again! Made this tonight. Fantastic! As far as the rice, I put the cooked rice in for the last half hour. Was perfect. Thanks for posting this. So glad you enjoyed it Rick! This soup is wonderful! Cooked well. I used some leftover rice from a Chinese carry-out that I had frozen. Just put it in at the end. Got going about 10:30 am and set to high for a while to get going and then on low till dinner. Really great flavor and so easy! Just love the recipes at this site! So glad you enjoy the site Debbie! We love this soup. Do you think it would be good with sausage too? Absolutely! In fact, I want to try that! So glad you enjoy the recipe!! I made a vegetarian version of this last night and it turned out GREAT! I used veggie crumbles and vegetable broth, served the soup on top of brown rice, and also just ate is w/o rice for lunch. This is an awesome recipe! And even better on the 2nd day! This one will go into my normal rotation. Thanks! I think I will try this with ground sausage…mmm sausage and peppers just make sense together. Delish! Thanks for sharing! I am unable to find that brand of tomatoes. Is there something special I have to look for if using a different brand? I just wanted to let you know this soup was delicious ! I put 1/2 cup uncooked rice in and added one cup of beef broth ( that made a total of four). Thanks for the info! I’ll do it your way! Love the recipe and tried it for the first time today. The cooked rice did soak up all the juice and it did get mush within 4 hours. However it did taste very good. I think I’ll try throwing in the cooked rice an hour or so before eating the next time I make this. Your recipe looks good. I love recipes with few ingredients. I was wondering why you couldn’t put the rice in iuncooked. I would think cooked rice would get too mushy. I too was concerned about mushiness but it turned out just fine. You could certainly try it uncooked. I would probably add a bit more liquid to allow for what the rice will absorb. Enjoy! You can definitely give it a try! As for the slow cooker on the stove top, it is one of the newer models out there. (You definitely don’t want to put a traditional crock on your stovetop 😉 ). Enjoy!! I make this soup a lot being one of my favorites. I prefer to just throw the rice in with the rest of the ingredients. I have used both minute rice and regular. They both turn out fine. I also use a can of tomato juice so there is a bit more liquid.